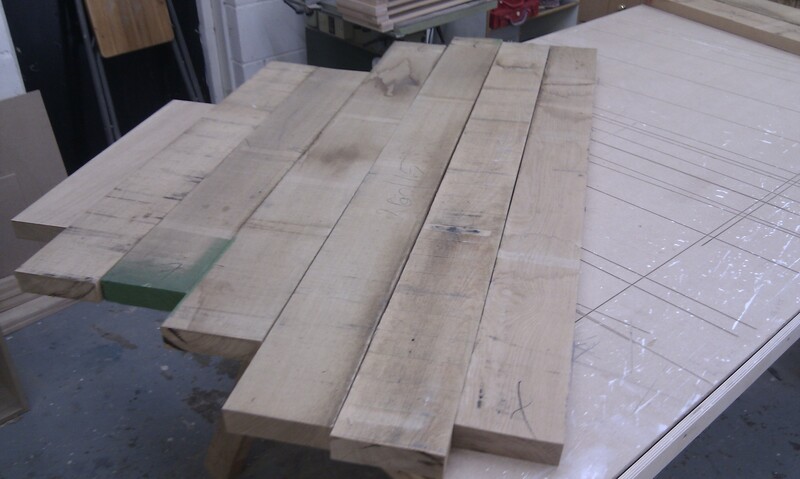 A cuppa Yorkshire Tea and it’s time for a trip to the timber yard to select the European Oak for the cabinet tops. Each board is carefully picked from the pack checking for defects, cupping, twists and bows. 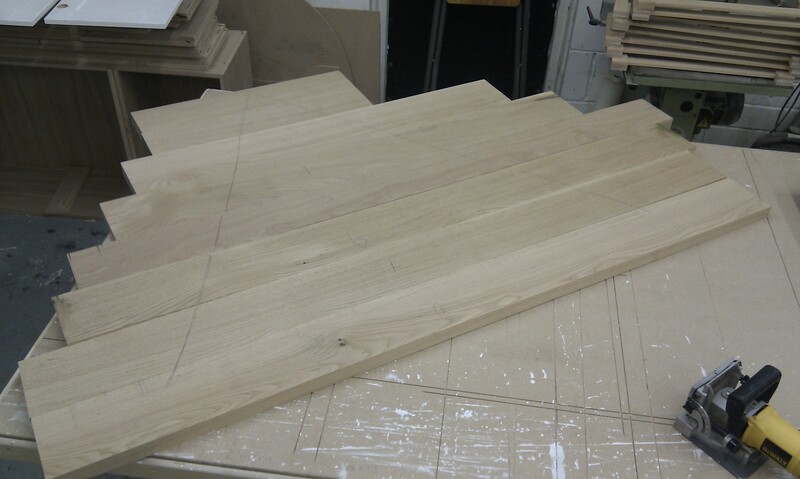 I also want a consistent wide stave of around 150mm. Sometimes this can involve quite a lot of fishing and along with yard staff banter it’s not long before a good hour slips by! Marked with red dots (Photoshop) are the approximate positions of the pieces that were selected. Back at the shop the boards are cut to approximate lengths to a ROD (full size template) of the media cabinet top that I had roughly marked out on the cutting bench’s sacrificial top. Ignore the random lines to the right. 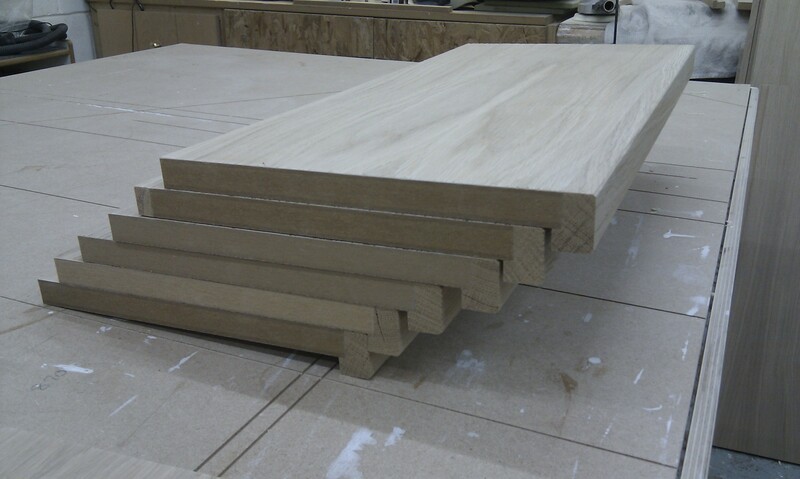 These are through cuts from the panel/rail saw, previously made whilst cutting up sheets. The boards are faced and edged (like the Beech in Week 1). 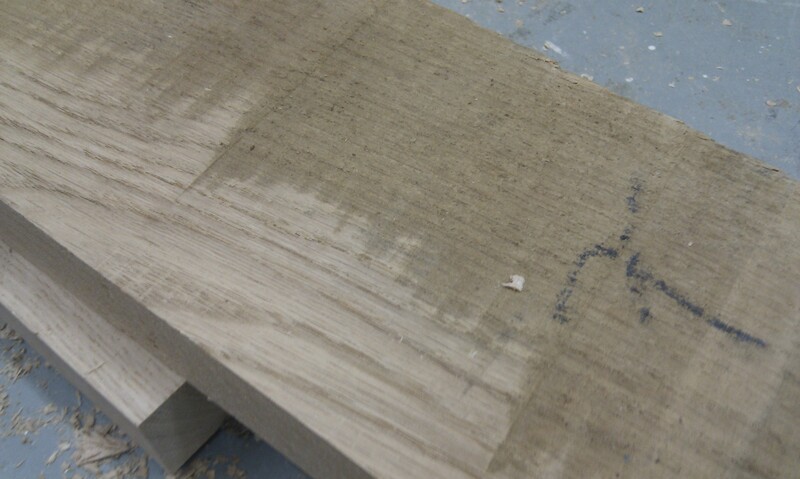 You can see the results of the first plane pass here and the figure of the grain revealed from the rough sawn board. This is a really enjoyable part of the process :). 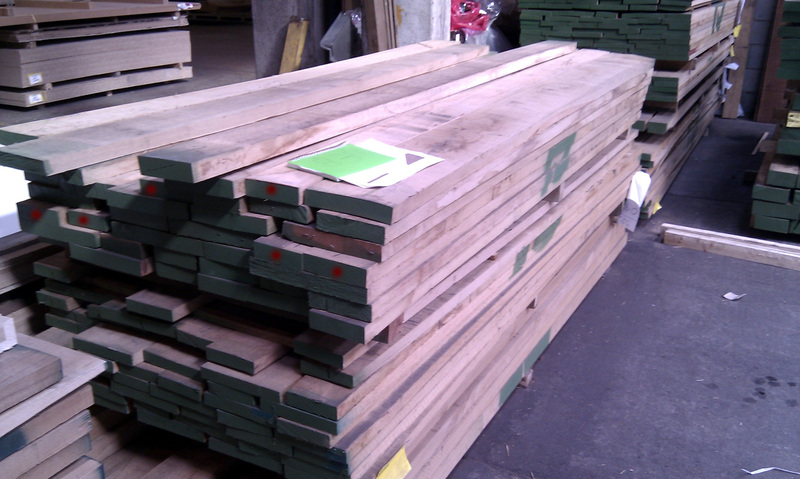 The faced and edged boards are back on the ROD, numbered and marked up with biscuit joint positions. The triangle mark acts as a reference to return to after jointing. 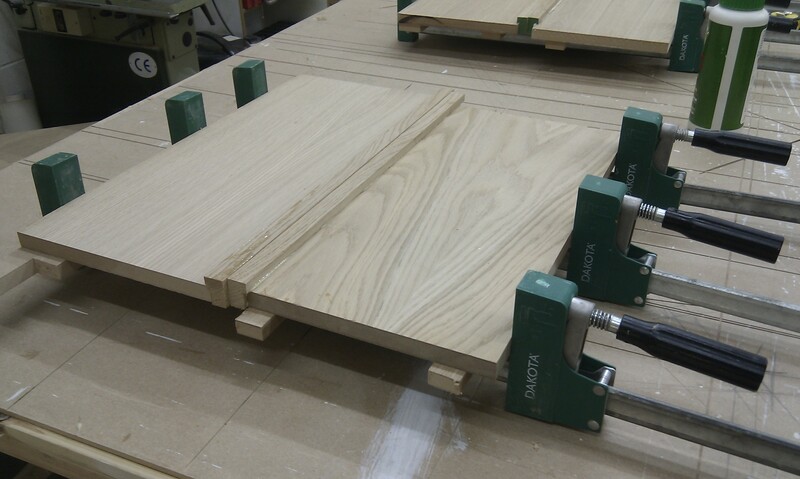 The boards are glued and clamped. Two straight edged pieces of timber help to keep the top flat and stop the sash clamps from cupping the top whist it’s under pressure during glue up. 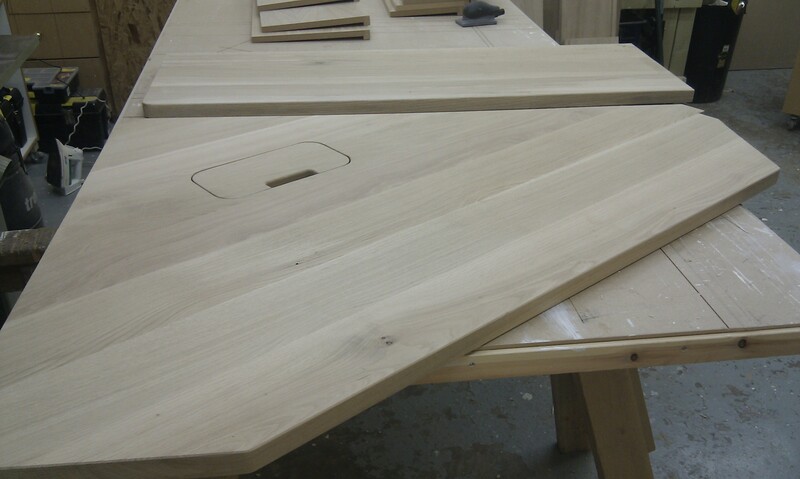 Due to the size of the top this assembly was done in two stages. 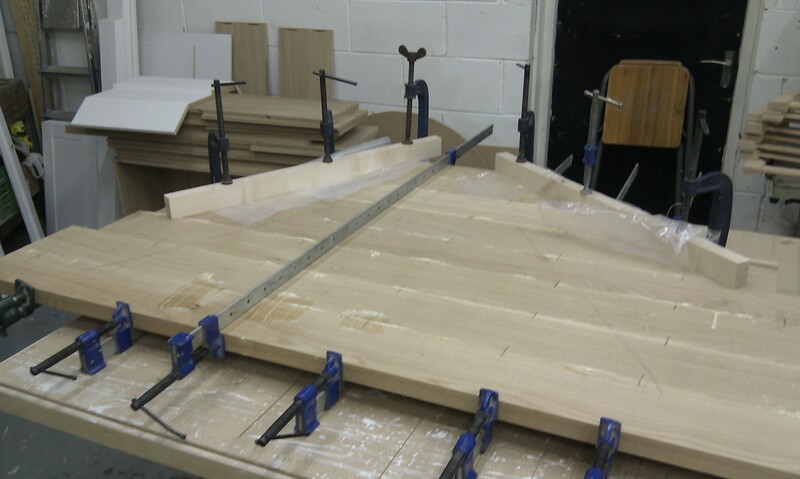 Below shows stage two, the last 3 staves being glued onto the back of the front 5. After glue up the assembled top is scraped to remove the excess glue. 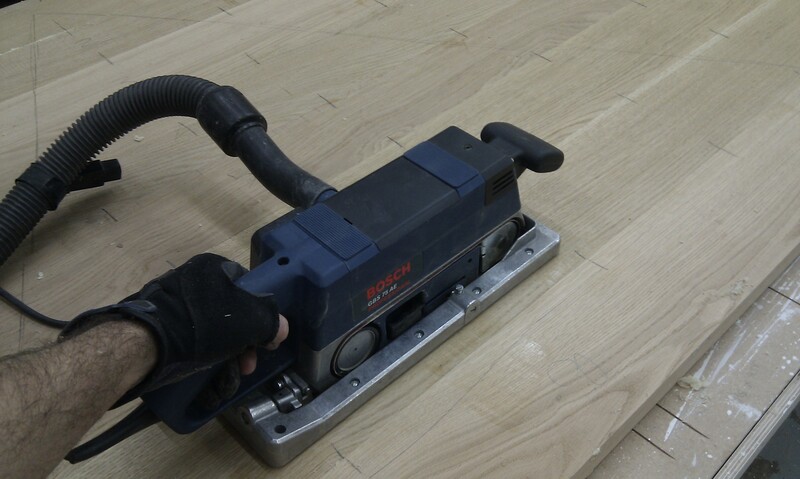 A belt sander (in a frame to maintain flatness) is run over the top inline with the grain. 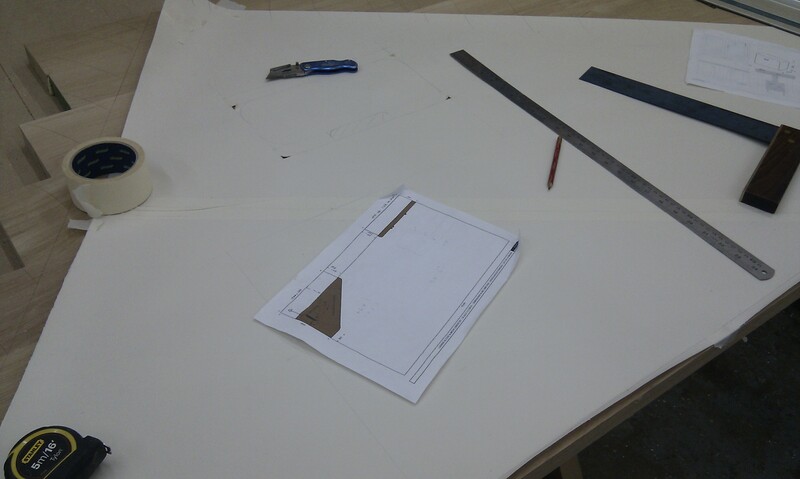 The ROD is transferred to a more accurate paper template to layout details onto the prepared top before dimensioning. Seen here is the cable grommet positioning along with an addition +25mm edge to allow for wall scribing tolerances on fitting (i.e. wonky walls!). The cut out tops. 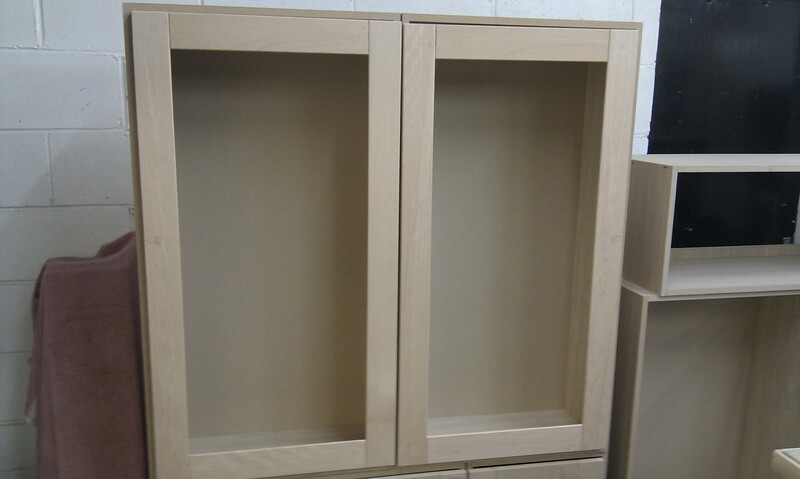 Picture foreground shows the media cabinet top and behind it the right alcove top. Radius’ (radii?) 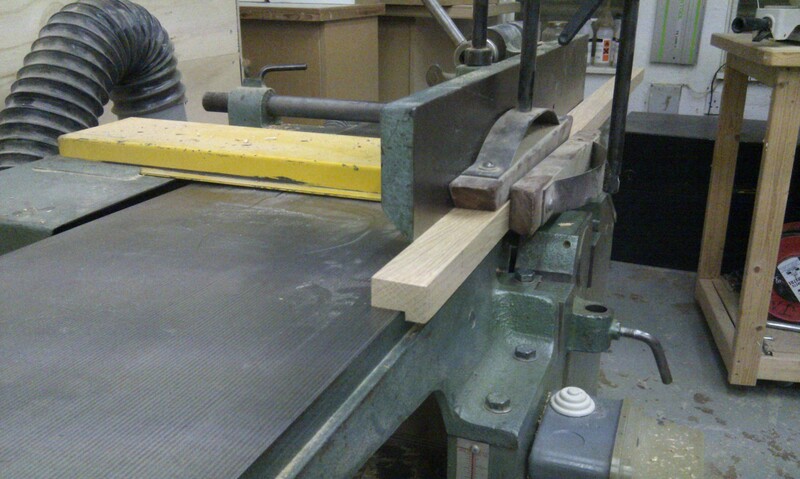 are run round the corners using a 9mm MDF guide template and a top bearing twin flute cutter in a hand held router. Both tops have 4mm chamfers run around the edges. 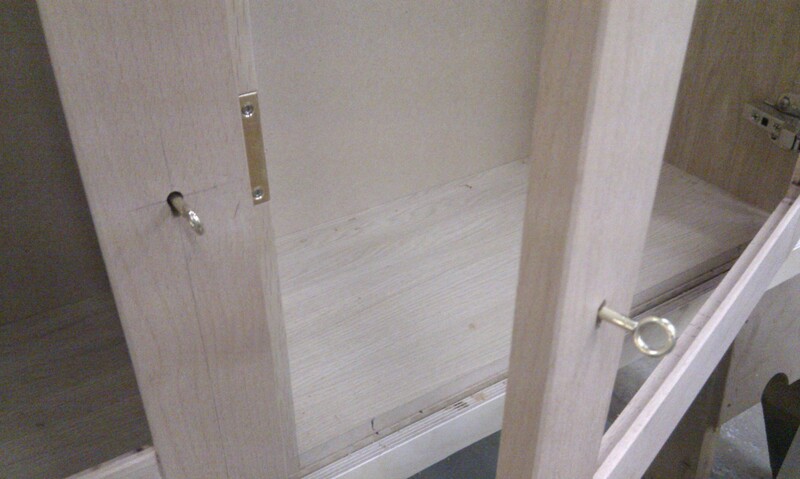 Behind can be seen lipped shelves which were assembled earlier whilst waiting for the glue to cure on the tops (construction details below). Detail showing lift out cable gromit. Preparing shelf lippings with a rebate. 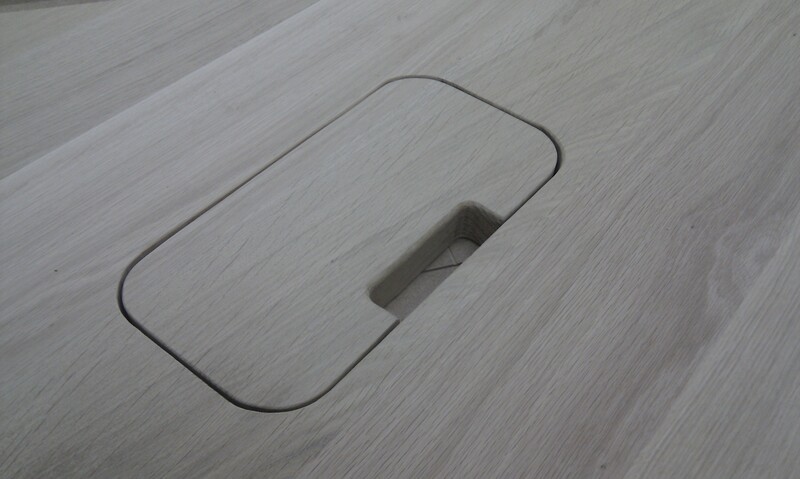 The lippings help to support the edge from sagging and give more presence to the shelf design. Left alcove bookcase shelving cleaned up, dimensioned, chamfered stacked up and ready for rub down and finishing next week. Tea time 🙂 before week 3. This entry was posted in Cabinetry and tagged alcove cabinetry, european oak, media cabinetry, work-in-progress.